We count on first responders to jump headfirst into dangerous situations, but how do they gain the experience to do so without endangering themselves? Training facilities designed to mimic urban streets and buildings—called city grids—are a key part of emergency response training. By creating realistic but controlled conditions, city grid facilities prepare fire fighters and police officers for real-world emergencies. When the Washoe County Sheriff’s Office, in Nevada contacted Falcon Structures, they wanted to add a structure to their city grid that could simulate emergencies in office, hotel, apartment and residential settings. 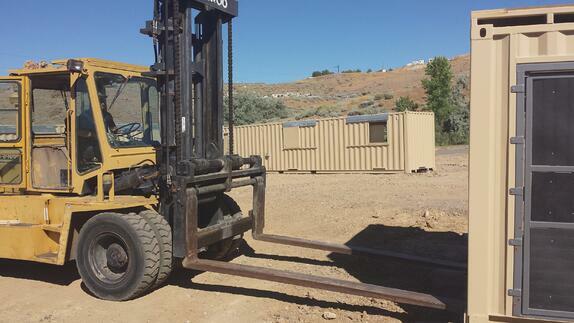 Jeremiah McCauley, Facility Coordinator for The Regional Public Safety Training Center in Reno, Nevada, knew that modified shipping containers were an effective solution for the Twenty-nine Palms Military Base’s MOUT (Military Operations in Urban Terrain) town, and saw their potential for the Washoe County training center. “The number one reason we chose shipping containers was cost. The second reason was durability,” said McCauley. The built-in forklift pockets on the modified shipping containers made for easy installation. The structure needed to be fairly sophisticated in order to emulate the unpredictability of the real world. Instructors needed to somehow keep students actively engaged in problem solving as opposed to simply memorizing floor plans. Trainees would also put the shipping container structure through significant wear and tear as they hosed down simulated fires and kicked down doors. There was also a budget to consider. Washington D.C.’s tactical village, which included four simulated buildings and a 40,000 square-foot enclosed structure, took six years and $5 million dollars to build. While D.C.’s facility was state-of-the-art, garnering a stakeholder buy-in on a multi-million-dollar project is difficult for most public safety departments. No one wants to spend millions of taxpayer dollars on years of construction only to discover the project wasn’t worthwhile. Based on the costs of our previous work, we knew that we could manufacture a functional training structure from shipping containers at a fraction of the usual price tag. The cost could be spread across several budget periods. Building a modified shipping container facility in phases is a lot like purchasing one LEGO® expansion pack at a time instead of constructing an entire model from scratch. Each phase’s modules arrive finished-out and assembly-ready, allowing the customer to begin use without a full set. Phase installation spread the training facility's cost over multiple budget periods. Phase 1 (top) included five 40-foot shipping containers, three of which were used to create a two-story structure with an open air balcony. 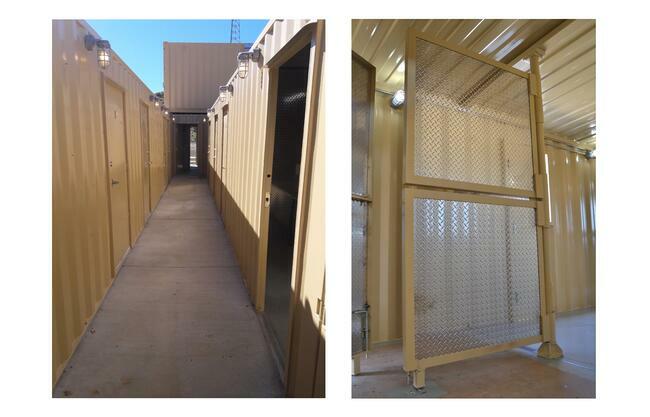 In phase 2 (bottom) the hallway was extended and capped with three additional 40-foot shipping containers. 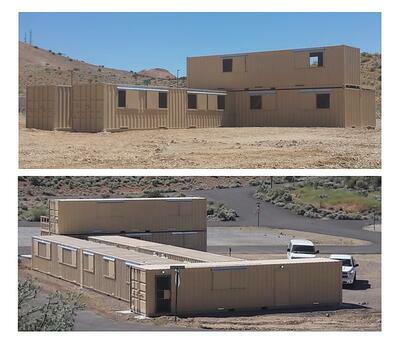 The Regional Public Safety Training Center (RPSTC) decided to leverage this modular advantage and started the project with a training facility made from five 40-foot shipping containers. Falcon used three containers to create a two-story structure with an open-air balcony and stairs. This structure can be used to imitate a residence. Attached to the lower level, two parallel containers create a corridor with multiple doors to represent a hallway in an office, apartment complex, or hotel. Inside the containers, instructors can pivot the walls into four different positions to create varying layouts for different training exercises. Window covers that roll on a track create low-light situations and surprise entrances during trainings. Installation of the modified shipping container facility via forklift took less than a week. The hallway (left) attached to the two-story structure can simulate an office, apartment or hotel setting. The pivoting doors (right) can be rotated into four positions. Students and instructors gave overwhelmingly positive feedback on the first phase of the installation once they began training. Once the first installation established that the shipping container facility was a success, the department ordered Phase 2, which included three additional containers to extend and cap the hallway. The sheriff’s department is planning to install a third phase in the near future. “Everybody loves it. They want to know when the next phase is coming,” said McCauley. An open-air shipping container village may not look exactly like a city, but it makes up for aesthetics with functionality and hardiness. Thanks to their durable steel walls, the department will not need to repair their training facility with the same frequency as a typical structure that weathers intense use. Whenever the RPSTC is ready for more shipping container modules, Falcon will be prepared to manufacture and truck them to Nevada with a two-month turnaround time. We hope that the lower costs of our modified shipping container structures will make these training resources more accessible to public safety departments around the nation. If you’re considering modified shipping containers for your training facility, contact us at 877-704-0177 or sales@falconstructures.com. We’ll be happy to provide you with a free, no-obligation quote for your project.